Thank you for purchasing a WordPress template. This documentation consists of several parts and shows you the entire process of setting up and administering a WordPress Website from scratch. sources.zip - contains template source files. psd - template Adobe Photoshop source files (.psd). CherryFramework.zip - Cherry Framework theme archive. Contains all theme files. Should be installed through WordPress extension manager. theme####.zip - theme(child-theme) archive. Contains all theme files. Should be installed through WordPress extension manager. widgets.json - contains widgets settings. fonts_info.txt - contains links where the template custom fonts can be downloaded. info.txt - contains instructions on how to extract source files. Template installation has never been easier. The installation process includes only three simple steps: Cherry framework installation, child theme installation and sample data installation. 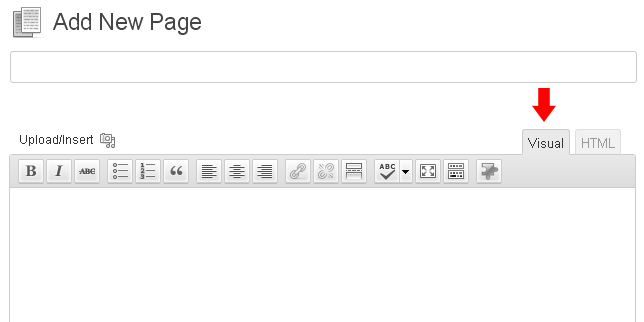 Log in to your WordPress admin panel (add /wp-admin to your domain name in the browser address bar). Look for a file called CherryFramework.zip. Click on it to select, then click OK.
Click the Activate theme link. For more information, feel free to check the detailed video tutorial on How to install Cherry framework template. Congratulations, you have just installed the framework. Look for a file called theme####.zip (where XXXX is the unique number of your theme). 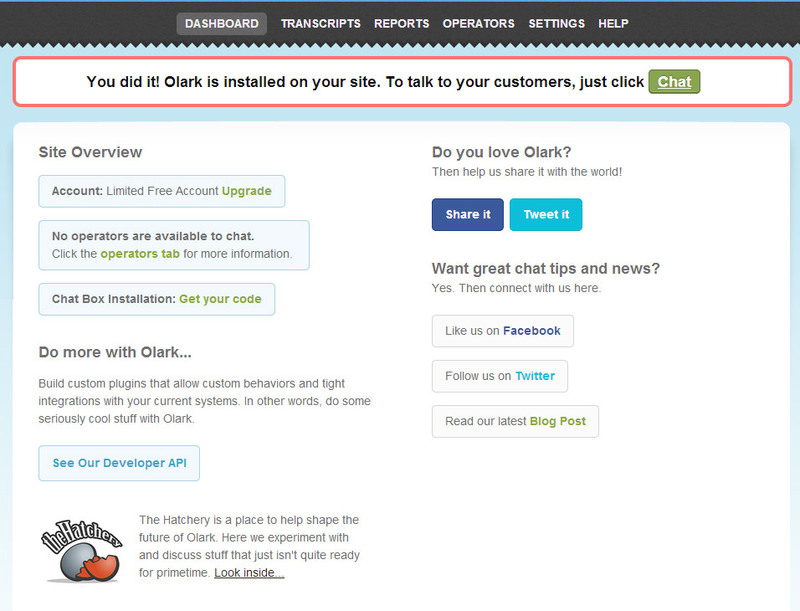 Click on it to select, then click OK.
Congratulations, both the framework and theme have been successfully installed! NOTE: For templates built on Cherry Framework v3.0 or earlier to install Sample data you need to upload XML and JSON files from "sample_data" directory. Images and other media files should be uploaded from "manual_install\uploads" directory. Make sure to upload all images from all subdirectories. 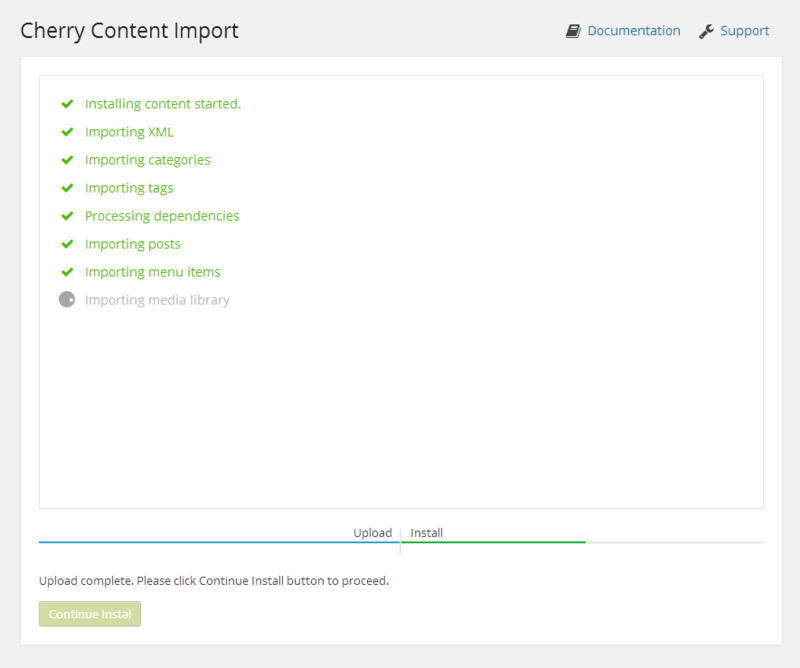 Go to the menu Cherry Plugin > Import Content. First of all you may see requirements table that shows if you hosting server meets Cherry Plugin requirements. Please contact your hosting provider if there are any warnings. If all server settings are OK you'll see uploading screen. 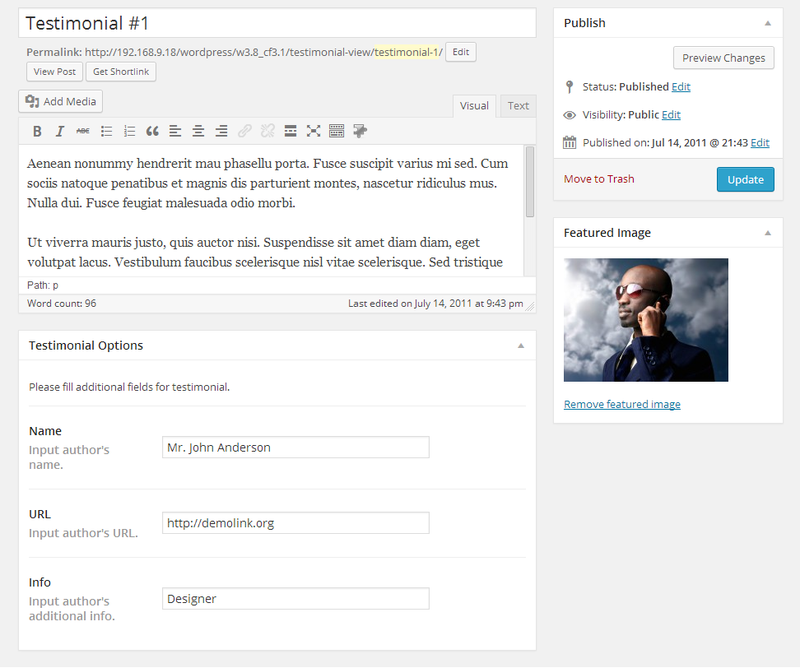 Open "theme/sample_data" directory from the template package and upload all files to WordPress. You can upload all files selecting them in the "theme/sample_data" directory (CTRL+A or Command+A) and dragging them to the uploading area. Make sure to upload all files from the sample_data directory including .JSON and .XML files. When upload is done click "Continue Install" button to proceed. ATTENTION: .JSON and .XML are required to proceed with the sample data installation. Continue Install button will be available only in case both .XML and .JSON files have been uploaded. Clicking "Continue Install" button will activate sample data installation process. Installation steps may take some time depending on your server settings. Please be patient. Congratulations! 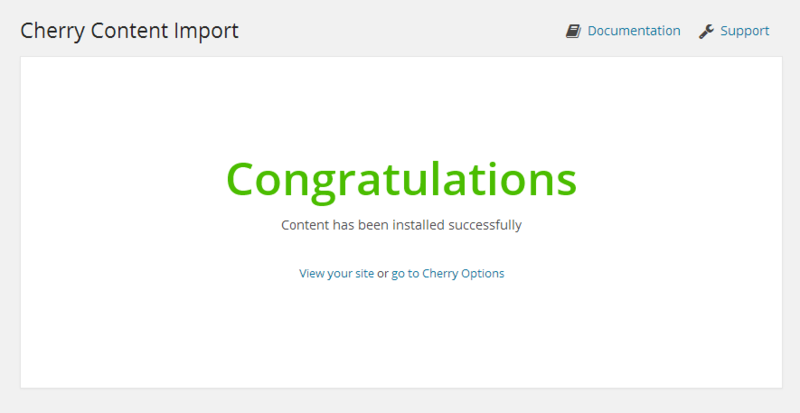 You have successfully installed your Cherry WordPress Theme. You can look at the theme now. To feel comfortable working with your WordPress template, we recommend that you download all applications required. You can see the list of required software on the template preview page. First of all, you need the right applications to extract the password protected sources_#########.zip archive. You can use WinZip 9+ (Windows) and Stuffit Expander 10+ (Mac). You may also need Adobe Photoshop application. It’s used to edit .PSD source files and it’s necessary if you want to edit template design graphics and images. As WordPress CMS is a PHP/MySQL based application, you need to prepare a hosting environment to run WordPress. If you have a live hosting, please make sure it matches WordPress software requirements and is ready to be used for WordPress websites. Otherwise, you can run WordPress locally on your computer using the local server. To create a local hosting server, please use the localhost applications, such as WAMP, AppServ, MAMP, etc. Any of those can be easily installed as any other program and used to run WordPress. Download the correct WordPress engine version. 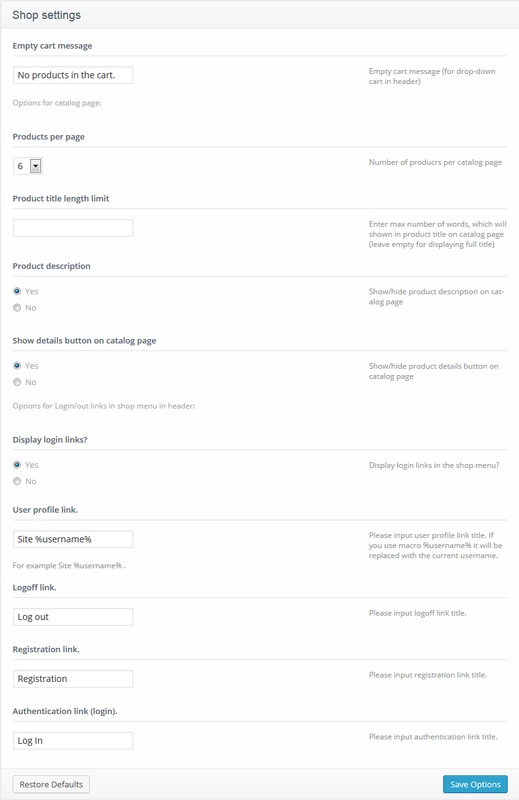 At the template preview page, in the requirements section, you can see the required WordPress version. Please make sure you are downloading the correct one. 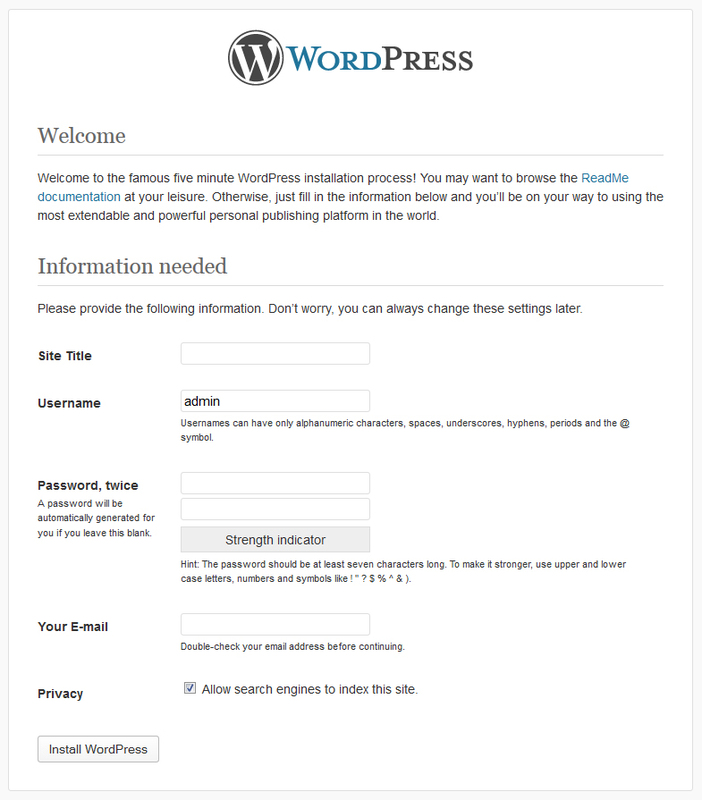 The WordPress engine can be downloaded from the official website at WordPress.org Download WordPress. In case you need an earlier release, you can click the Release Archive link. When you are done with the downloading, you need to extract the files from the engine and template packages. 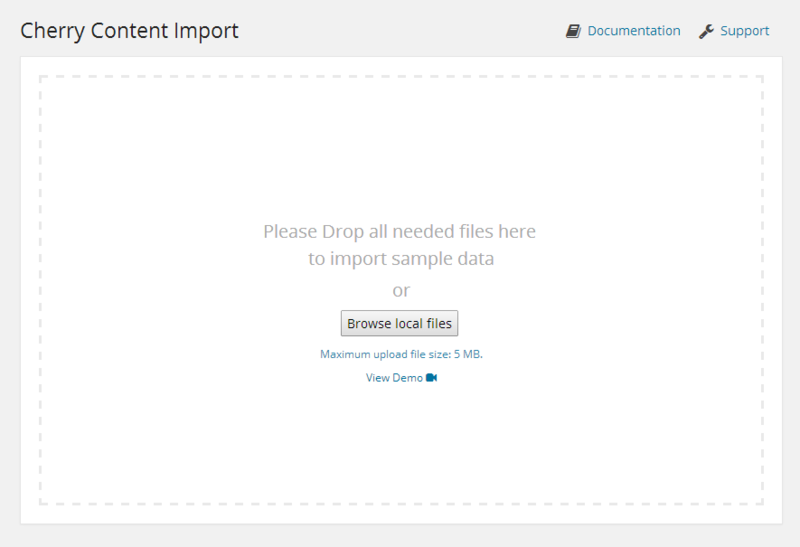 To extract the files from the WordPress engine ZIP package, you can use any archive manager that can handle ZIP archives. The following tutorials will show you how to extract files on Windows(WinZip) and MAC(StuffitExpander). After extracting the files, you need to upload the WordPress engine files and folders to your hosting server. All these files and folders should be uploaded to your hosting server. The engine files should be uploaded to the PUBLIC_HTML or WWW directory on your server. If you don’t see PUBLIC_HTML or WWW directories on your hosting server, please contact your hosting provider and specify where to upload the website files. At this step you need to create a database which will be used by your WordPress engine. You can create a new database using the database management tool from your hosting control panel (usually PhpMyAdmin). 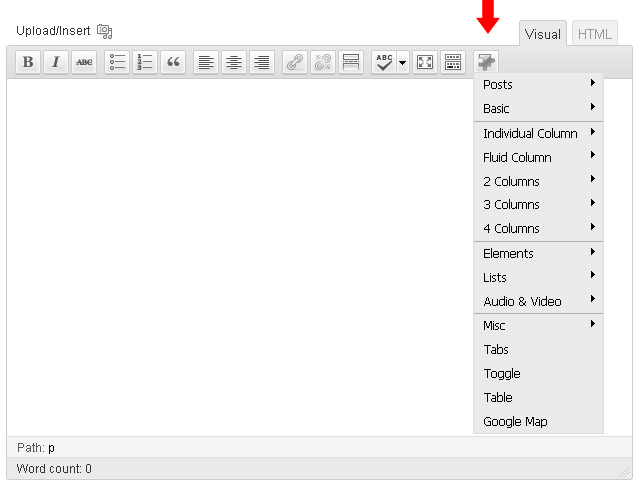 Click the Database button from the top navigation menu to access the database listing. Input database name into the "Create new database" field. Click the Create button on the right side. Your database can be seen in the database listing. Click on its name to get access to the database. 1. Click the Database button to access the database listing. 2. Input the database name. 4. Your database can be seen in the database listing. Click on its name to get access to the database. You can also check the detailed video tutorial on How to create a database. If you have any issues creating a database, please contact your hosting provider for help and assistance. In your browser address bar, type your domain name/root to the WordPress files and press Enter. This will start the installation procedure. Creating a configuration file. 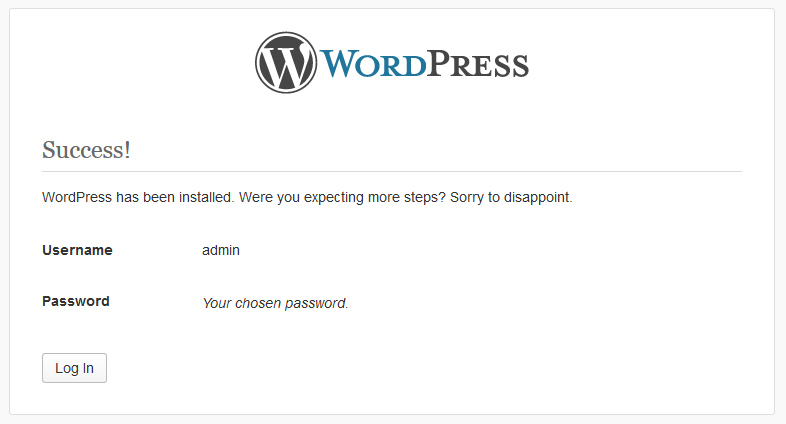 The initial WordPress installation screen will notify you that the configuration file is unavailable. Click the Create Configuration File button to create it. Inserting database details. 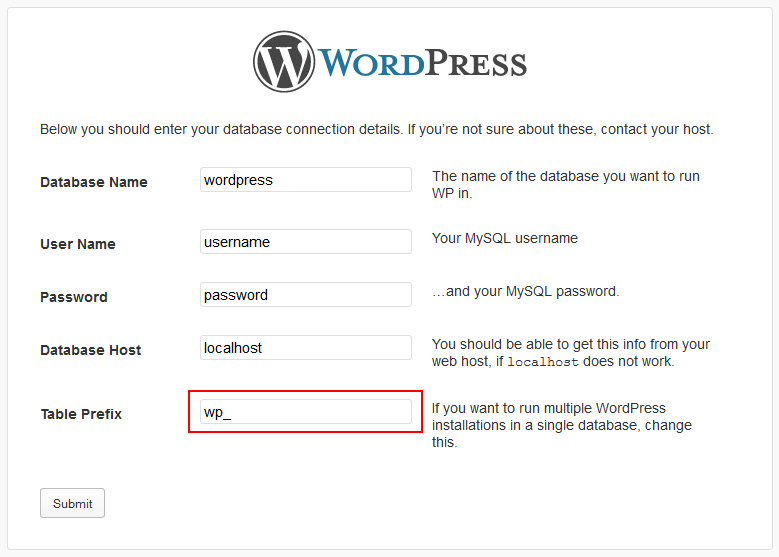 You need to input the WordPress database connection details here. When you are done, click the Install WordPress button. 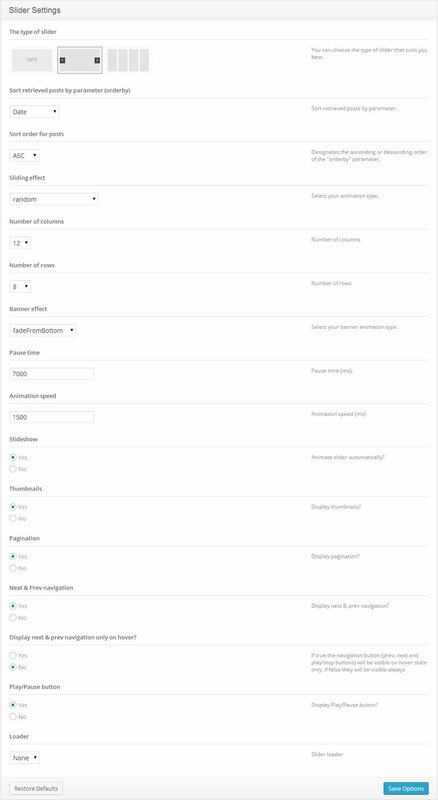 If all data has been inserted correctly, you’ll see the Success window with the button to log in to your WordPress administration panel. If you are having problems with installing the sample data, please follow the instructions below. To make your WordPress look like our live demo, please follow the instructions below. Make sure the theme has been installed according to the following directions. Copy the"uploads" folder (that is located under the theme/manual_install/ folder of your template package) to the /wp-content/ folder on your FTP. Please, make sure that you do not have the forward slash "/" sign at the end of the address and the url starts with http://www. If there are problems with installing them via the admin panel, here's the alternative way to do it. If you have installed the theme with the sample data install or manual install and the theme is displayed differently from the Live demo, please open Cherry Options and click "Restore Defaults." Unzip the CherryFramework.zip and theme####.zip files to any folder on your hard drive (first, right-click each of the .zip files, select Unzip to… CherryFramework and theme#### accordingly, so you get the two folders called CherryFramework and theme####). Upload the CherryFramework and theme#### folders to the /wp-content/themes/ directory on your FTP server. Under the Available Themes section find theme#### and activate it by clicking the Activate button. When the theme is activated, on the top left corner you will find the notice to install additional plugins. Follow the Begin installing plugin link. 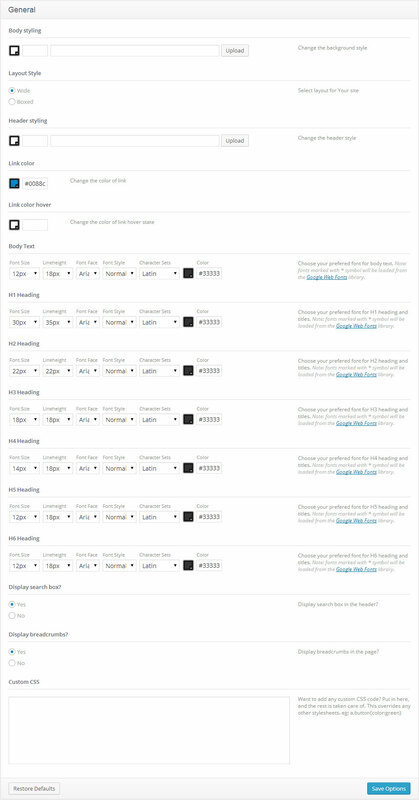 You can also install the plugins from the Dashboard, navigate to Appearance- > Install Plugins. 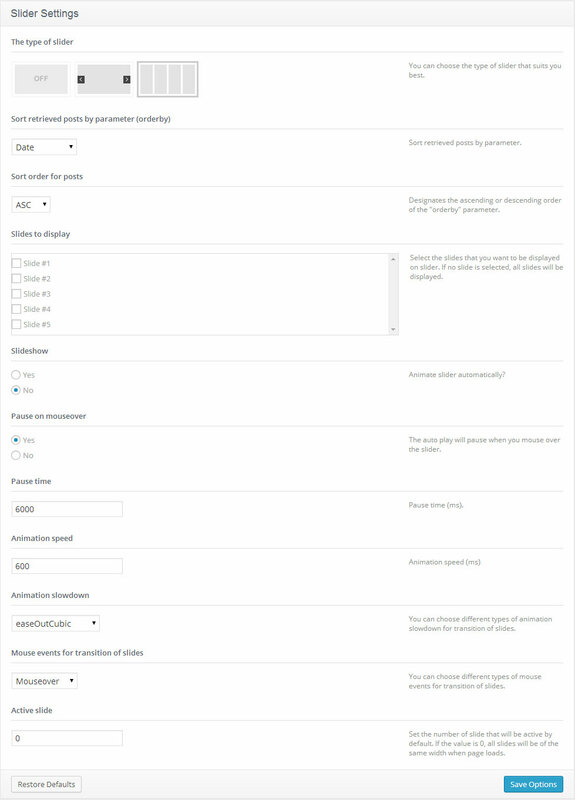 In the Bulk Actions drop-down menu select Install and click Apply. Attention: Installation and activation of Cherry Plugin is required for the correct work of shortcodes and widgets. Cherry Plugin is installed and activated by default on installing Cherry Framework. Description: The Cherry team has already created a Cherry framework that can be reasonably called perfect, but we are always looking for more improvements. Meet the Cherry Plugin. 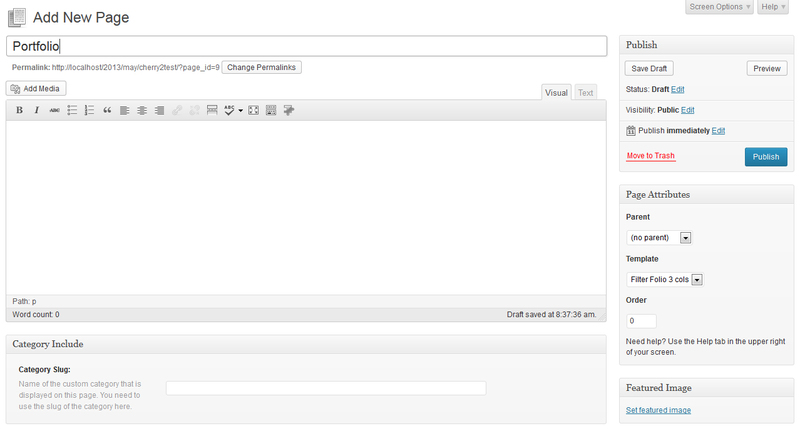 This is an extension for our Cherry framework where we've included all the shortcodes and widgets you will ever need. The plugin is fully compatible with any WordPress theme powered by Cherry Framework. So far, the plugin is a beta release, but we're going to keep on improving it to deliver even more cool features. Description: Contact form for contact page. Description: WPML makes it easy to build multilingual sites and run them. Description: A feature-packed eCommerce plugin built upon WordPress core functionality ensuring excellent performance and customizability. Documentation: Jigoshop documentation at Jigoshop Knowledge Base. Description: Social networking in a box. Build a social network for your company, school, sports team or niche community. Description: bbPress is forum software made the WordPress way. Description: Mingle Forum allows you to easily and quickly put a Forum on your WordPress site/blog. Description: This WordPress plugin is a complete forum system for your wordpress blog. Before updating Cherry Framework, we strongly recommend to make a backup of the current version. You can create a Backup for both CherryFramework and child theme. 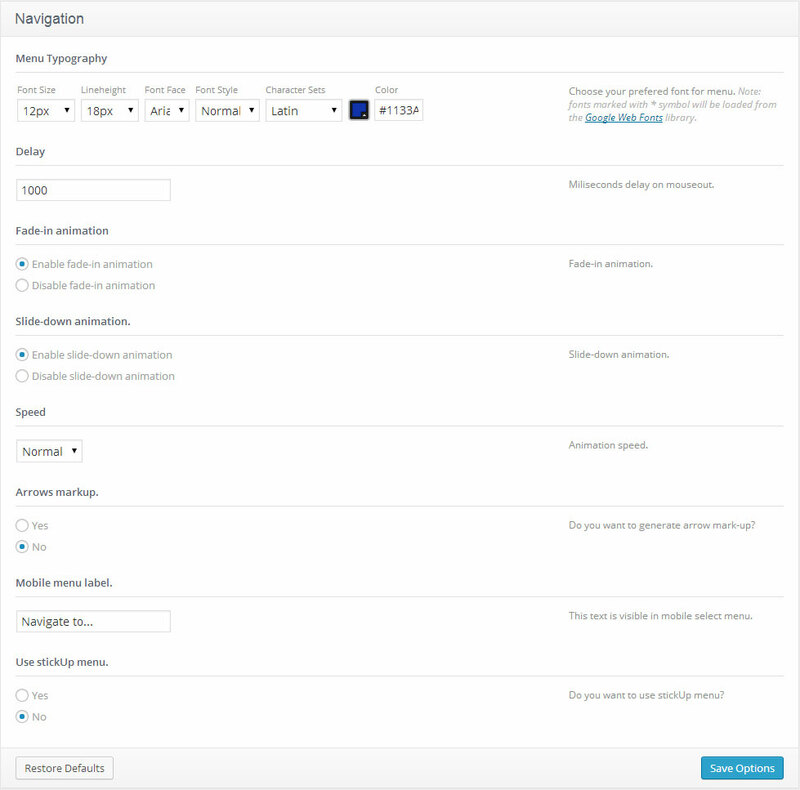 This can be done in "Cherry Options > Data management" section in WordPress admin panel. 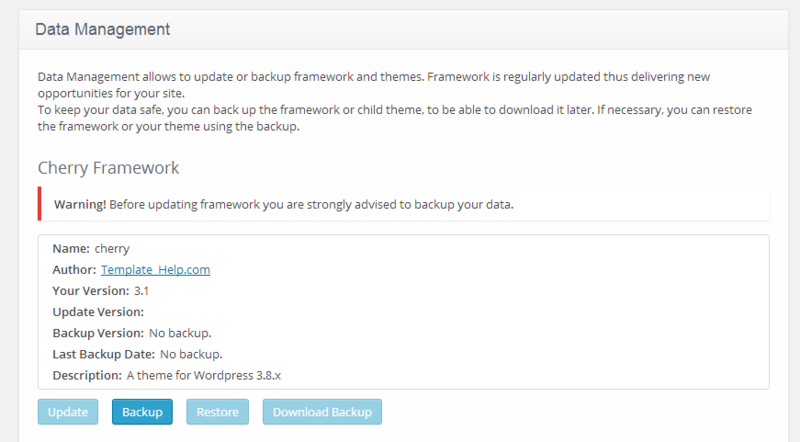 Backup can be easily done clicking "Backup" buttons under Cherry Framework and child theme blocks. 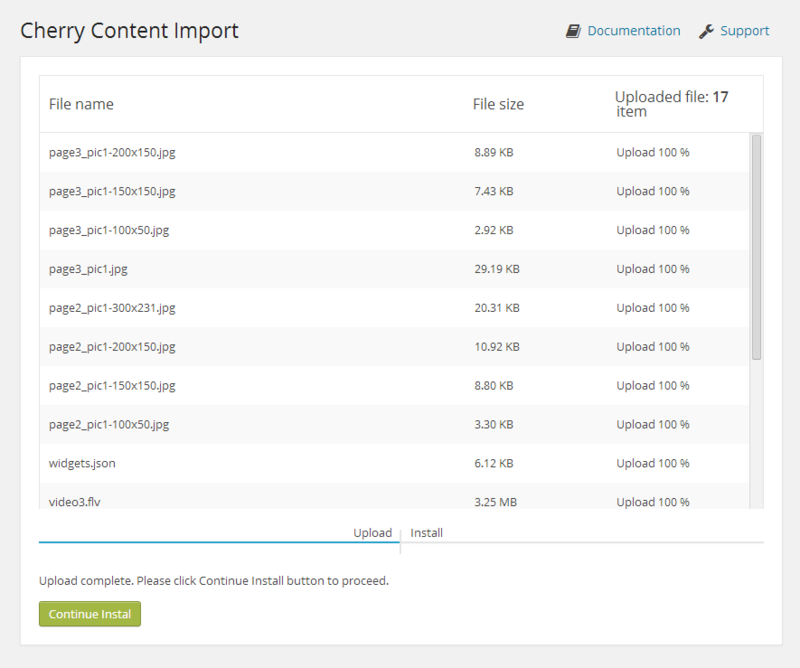 Now you can find the archive with your framework or child theme in the /wp-content/themes_backup/ folder. You can also download it clicking "Download backup" button. 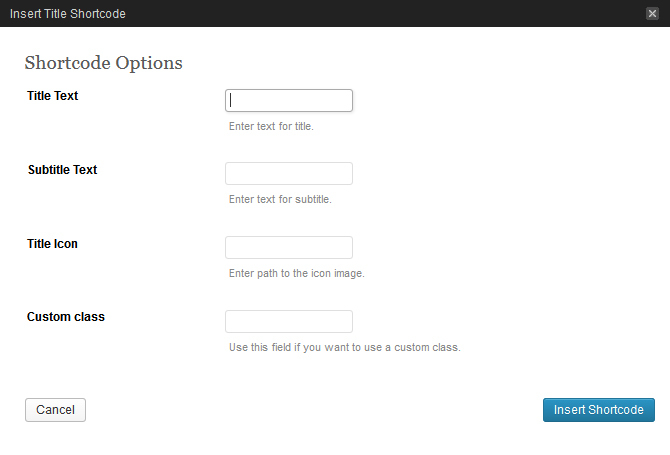 If some difficulties occur, you can re-install the framework via tabs Appearance -> Themes -> Install Themes -> Upload. In your admin panel, open the tab "Cherry Options > Data management". Wait till the process begins. Rest Cherry Framework will do by itself. ATTENTION: It is necessary to edit styles in the style.less file. 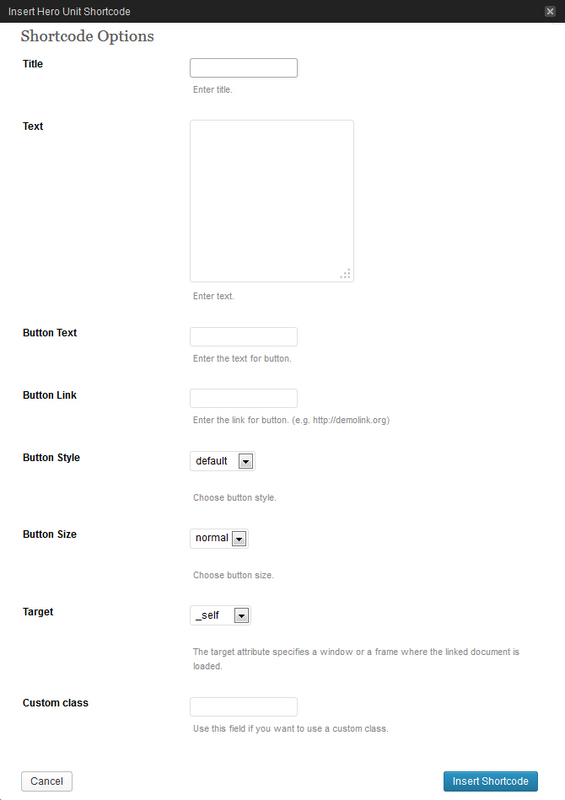 Because of options styles are compiled anew and the main-style.css file is rewritten after saving. 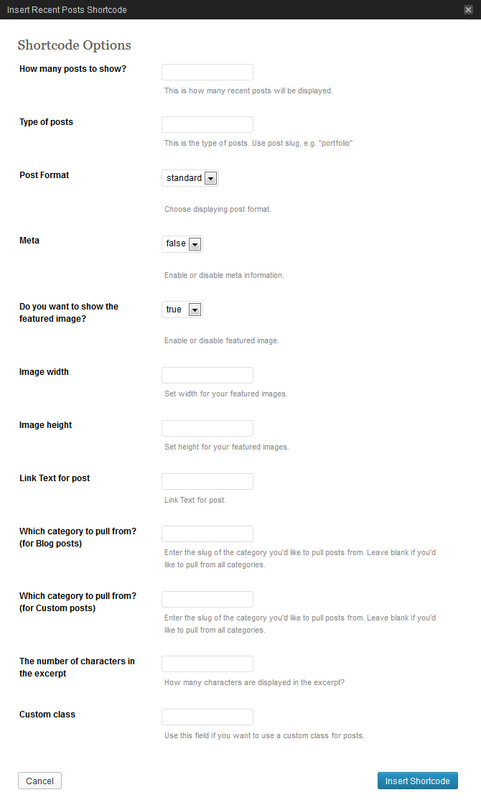 Please review the following link for more information on different post formats: http://codex.wordpress.org/Post_Formats. 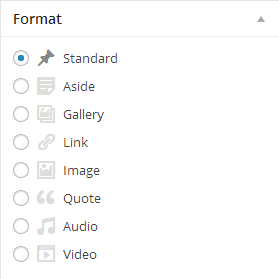 To choose the post format, check the ones listed in the Format box. Note: Some of these formats have their own options. Their settings will appear under the post editor. 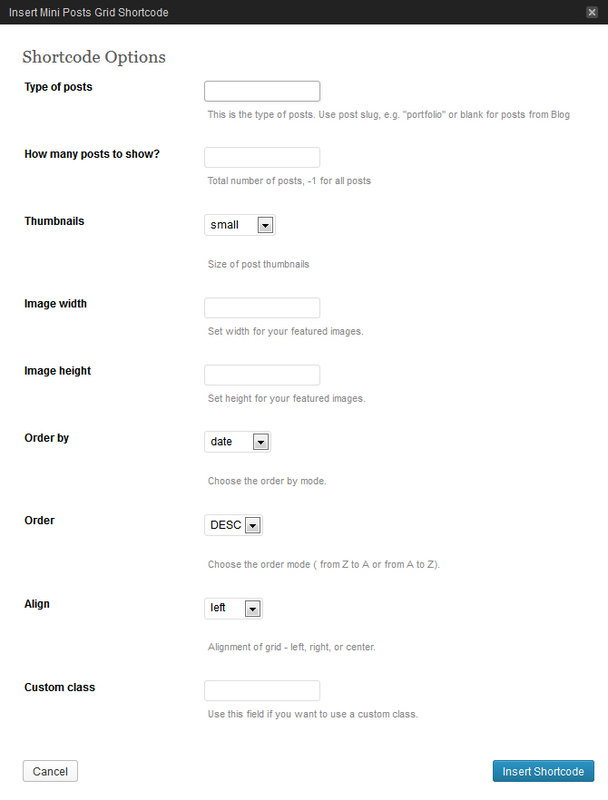 Below is the list of available post formats with their descriptions and settings. 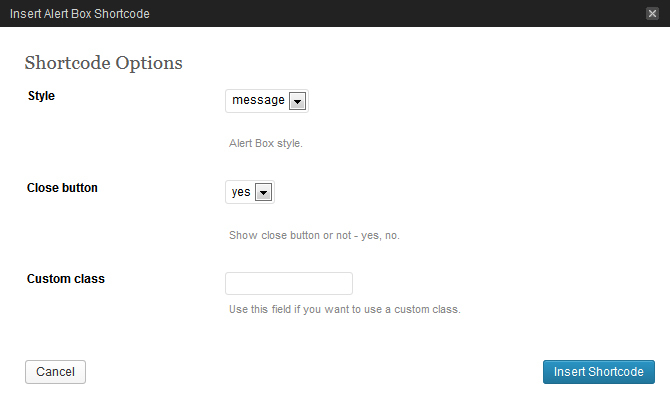 and other fields which can be enabled under the Screen Options section located at the top right corner. This is a simplified regular post version. 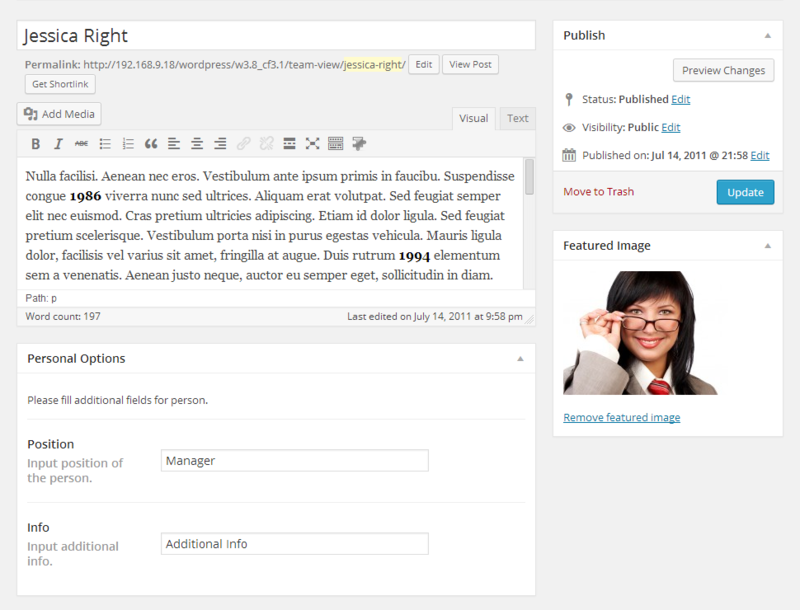 In other words, it comes with a post content field only and you don't need to fill in the post title and other fields. This is a so called post-note. The main feature of this post format is the ability to maintain unlimited number of attached images. To add images from your hard drive, drag and drop your files into the box that appears or click Select Files to choose a picture from your computer to upload. After the images have finished uploading, you will be shown all the images in your Media Library. Select Uploaded to this post to see attached images. When you’ve finished editing, you may close Media Library. The uploaded images will be attached automatically. 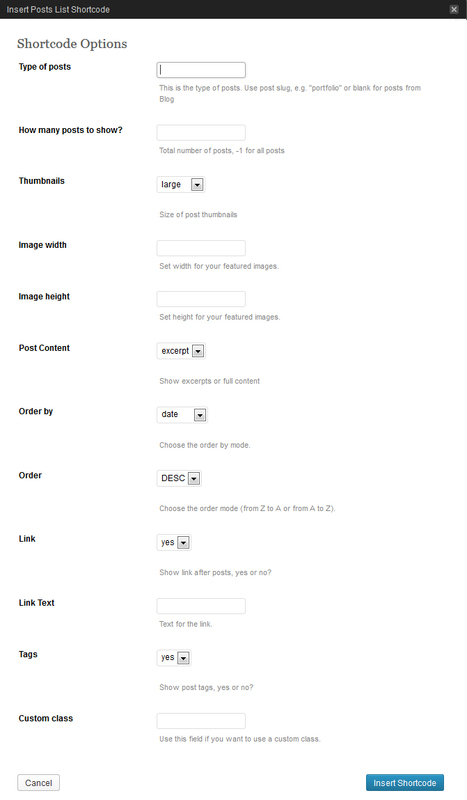 The gallery post format has all the standard fields (like title, content, categories, etc.) just like the regular post format. After selecting the Link post format, you will get an additional URL field where you need to specify the link (URL) for the target page/resource. The Post title will be used as your link text. 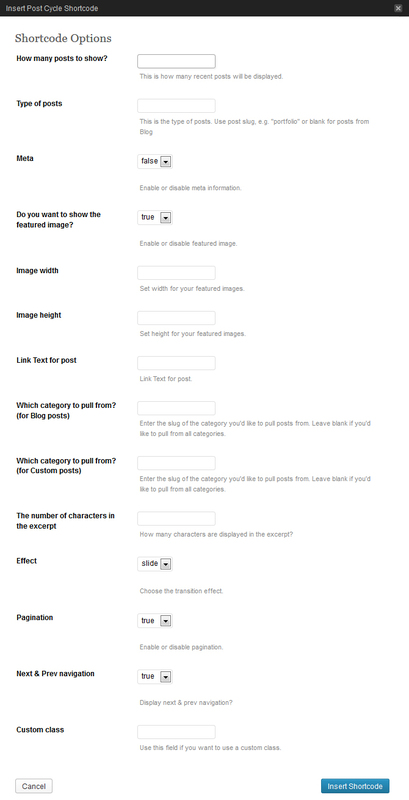 If you fill in the post content field, it will be used as the target page/source description. An Image post format is a post format based on a single image uploaded via the Featured Image option. Upon selecting the Image Post Format, you will be able to disable the lightbox image feature by selecting the corresponding setting in the Enable Lightbox image option. A Quote Post Format serves as a so-called post-citation. It's used to publish quotes. Upon selecting this post format, you will get an additional The Quote field - basically the body of the quotation and an Author field - the quotation author name. Audio Post Format is used for publishing audio content. A Video Post Format is used for publishing video content. Embedded Code - used for off-site video embedding, e.g. via youtube, vimeo, etc. 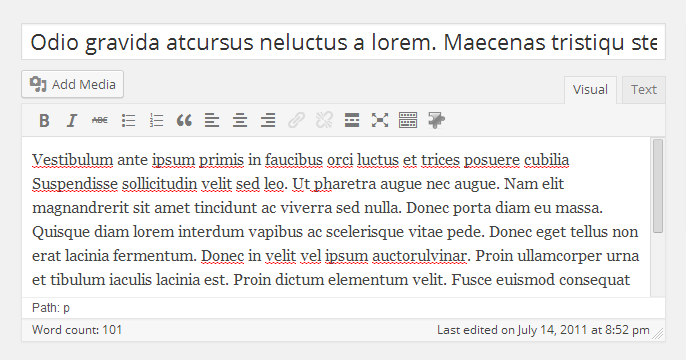 Slides are essentially a custom post type which means that they are different from common posts, such as blog posts. That allows us to manage the content of the site really easily. And now click the Add New tab. 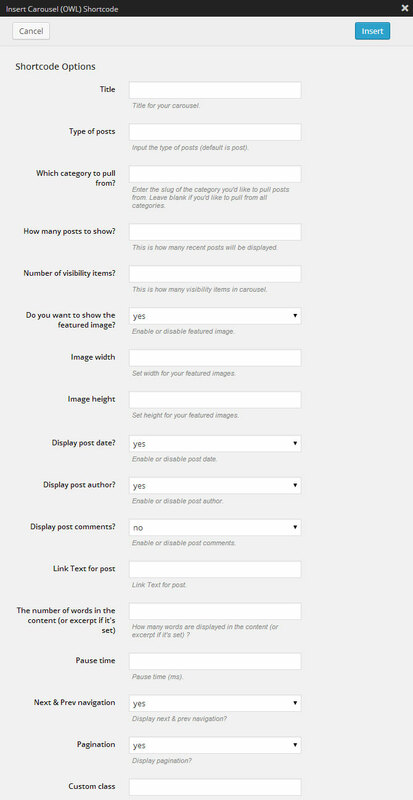 Upload your image through the Featured Image option (click the Set featured image link). Caption - the field for the slide caption. URL - the field for the slide URL (you can put an external link here). When you are done, click the Publish button. Portfolio items are essentially a custom post type http://codex.wordpress.org/Post_Types#Custom_Types which means that they are different from common posts. That allows us to manage the content of the site really easily. And now the Add New one. Fill in all the required fields (title, content). And click the Publish button. 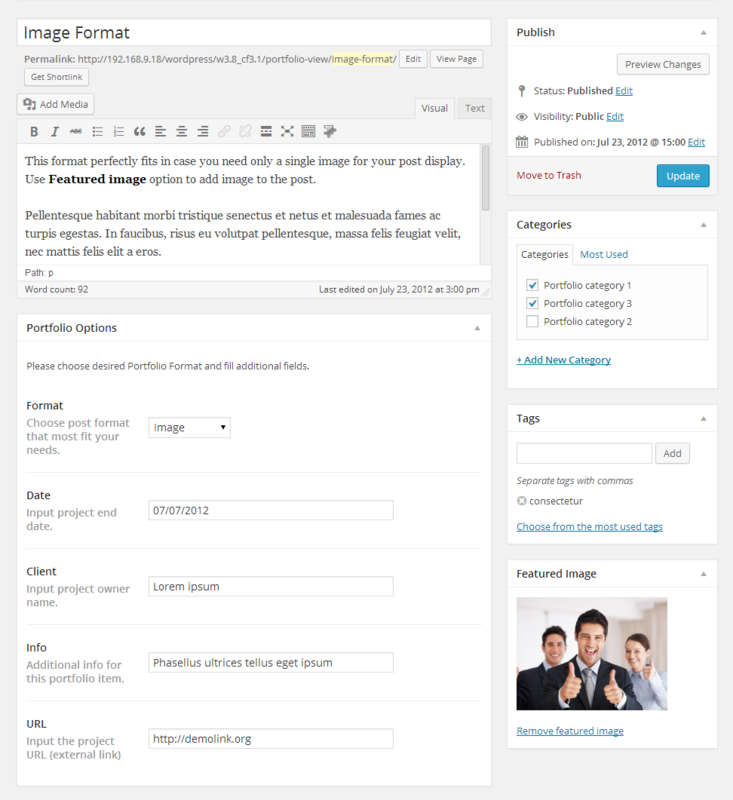 Creating a portfolio post in this theme allows you to select one of the available post types. Image - a default gallery post format. Displays only the featured image. Slideshow - the project gallery is displayed as a slideshow. It can contain an unlimited number of images uploaded and attached to the post. Grid Gallery - post images are displayed as a gallery. Can contain an unlimited number of images uploaded and attached to the post. 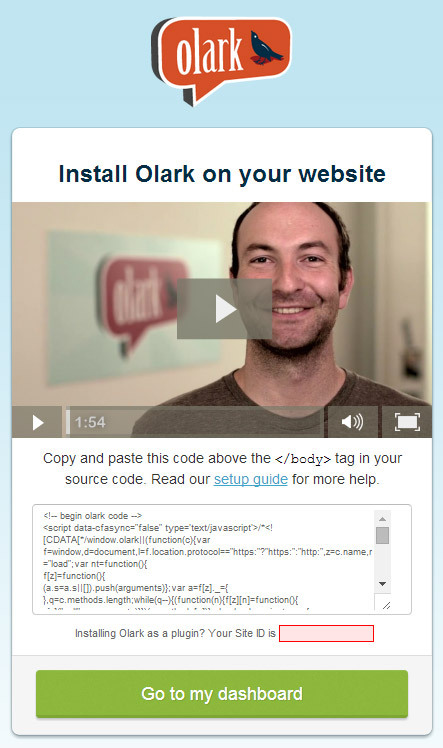 Video - in this post type you can embed a video from any video hosting (YouTube, Vimeo, etc.). Audio - selecting this post type, you can embed your audio link. Then click the Add New tab. Upload your image with the help of the Featured Image option (click the Set featured image link). Info - author's additional info. And now the Add New button. Since it is a question/answer type of post, the title of the post is the question and the content is the answer. Click the Our Team tab. Upload your image using the Featured Image option (click the Set featured image link). Portfolio pages can be created with the help of the page templates. Type in your page name, for example Portfolio page. Select your page template ( Filter Folio 2 cols, Filter Folio 3 cols or Filter Folio 4 cols in the Page Attributes drop-down menu). With that done, click the Publish button. 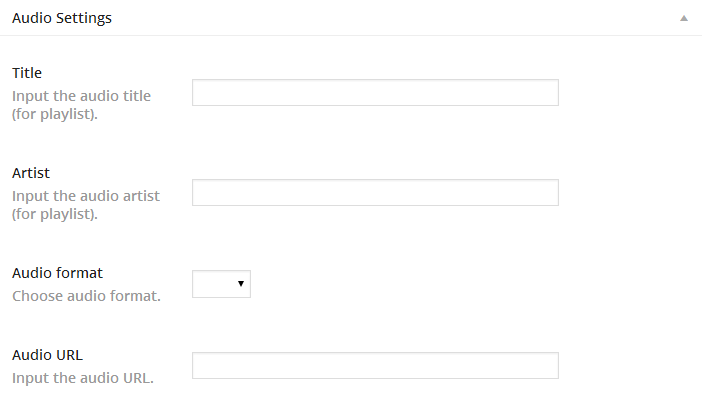 You can create a category portfolio page using the Category Include field. You need to write the slug of the category which you want to be displayed. 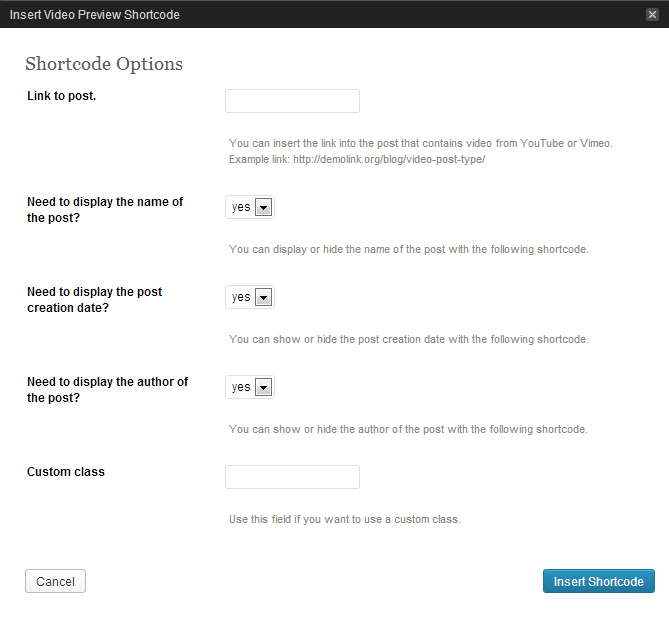 Then please click the button for the shortcodes. 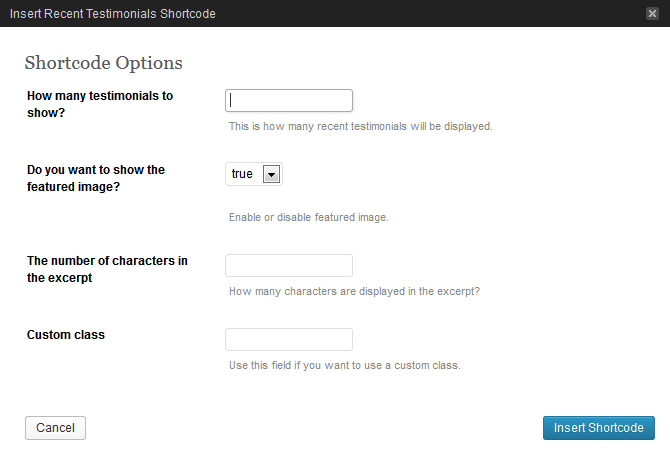 After that, select the shortcode you want to insert. Grid Columns - various columns for grid forming. Elements - additional elements for content forming. Other - additional elements for advanced/complex content forming. Description: displays standard and custom posts in table view with a configurable number of columns and rows. Description: displays standard and custom posts as on the blog page. Description: a more compact version of the [post_grid] shortcode. 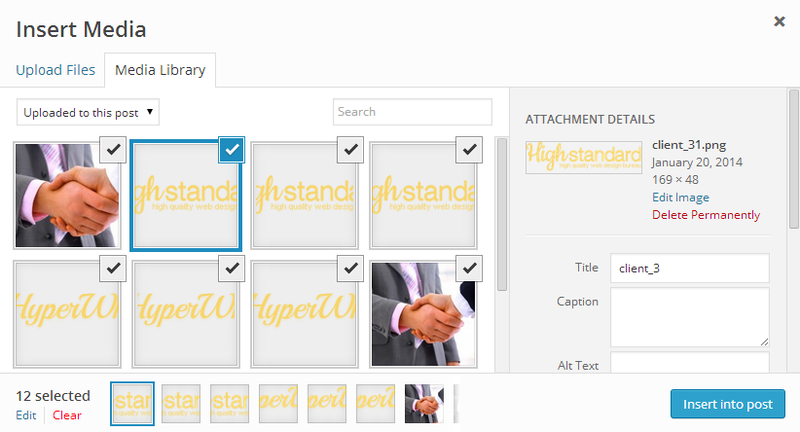 Displays the images of standard and custom posts with a configurable images size. Description: a more compact version of the [posts_list] shortcode. Displays standard and custom posts in list view. Description: displays the recent posts which can be configured with the following options (post type, number of posts, post format, excerpt length, button title and others). Description: displays the specified number of Testimonials custom post type posts, includes the ability to show/hide posts images and manage word count. Description: used to display a block with static text and/or image, title, link, etc. Description: displays the latest comments. Description: compact display of different posts in mini-slider view. Description: displays the posts in carousel view, has various additional options. Description: Roundabout is a jQuery plugin that converts a structure of static HTML elements into a highly customizable turntable-like interactive area. Description: used to display information blocks that include title, icon, text, button. The main feature of this shortcode is the existence of pre-installed icons. Description: used to display major website information, promotions, etc. Usually located on the main website page, right after the header. Description: used to display the categories. Description: used to display the tags. Description: used for the formation of structural grid elements, where # is a number from 1 to 12, which defines the element width. Description: used to form structural grid elements, where the grid elements width is delineated with %. Multiple Columns shortcodes are used to simplify content forming by inserting the most common grid variants. 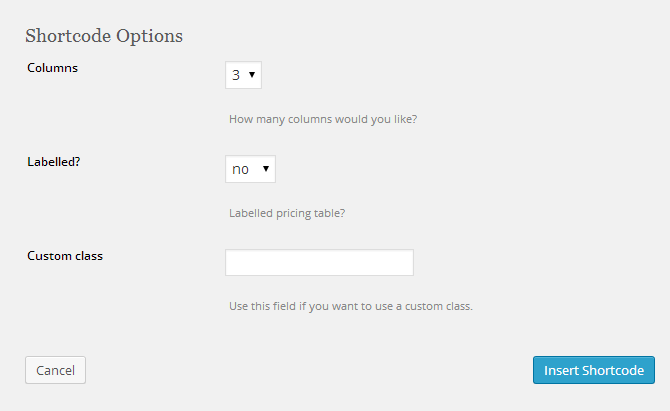 You can also add custom classes to Columns category shortcodes. This expands customization options for specific blocks. Description: used to display a label with pre-defined styling. Description: used to highlight a chosen text fragment. Description: used to insert a button with various display settings (style, size, icon, etc.). Description: used to display a dropped capital letter. Description: used to display a quotation. Description: used to display a simple icon. Description: used to display a container, which can maintain various content. Description: used to display an alternative horizontal line with a smaller margin. Description: used to display a vertical line. Description: used to set vertical spacing between elements. Description: used to display an indicator of some process completion. Description: used as some container for the address. Description: used for the re-zeroing of element flow around. Description: a set of shortcodes used to display various lists stylizations. 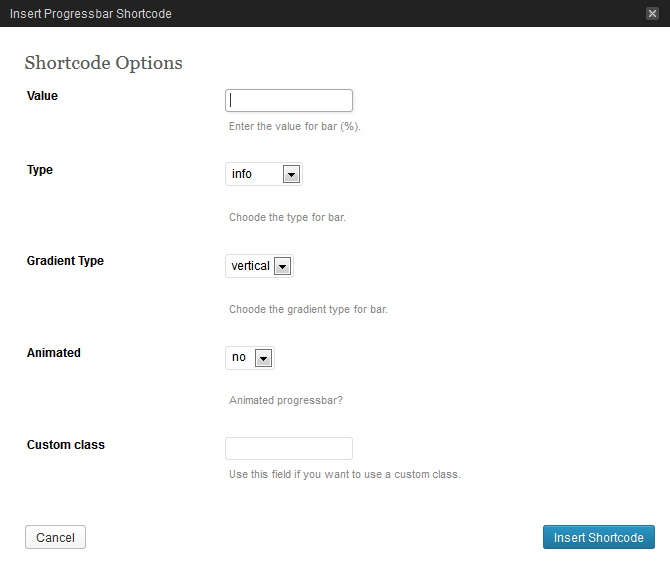 Each shortcode implements its own marker for the list items. Description: Shortcode for wrapping content with block with overflow:hidden. Description: Shortcode for wrapping content with block with pseudo classes :before and :after for displaying full width block. Description: used to insert video preview, which can be loaded from the off-site services (youtube, vimeo) or from your website (self hosted). Description: a shortcodes set used to display service messages. Description: used to display the close icon which closes the parent element. Description: used to insert a stylized container. Description: used to insert a text block with a smaller font size. Description: used to display double title: the main title text and an additional one. Description: used to display content arranged into tabs. Tabs may contain static and dynamic content. Description: used to display an accordion - fold up panels with titles. Description: used to display a table. Description: used to display Google maps. 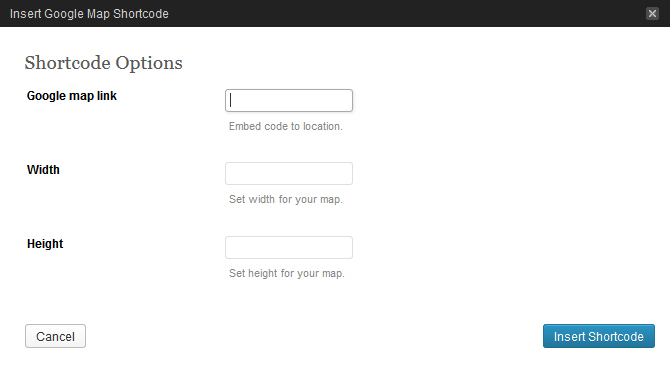 To make the shortcode work, you need to insert the desired location link from Google. Description: used to display Pricing tables. Add or edit a page or post. Click in your content where you want the player to appear, then hit Add Media above the content editor. Upload an audio or video file. Make sure the file you uploaded is selected, then under Attachment Display Settings, set Embed or Link to "Embed Media Player." 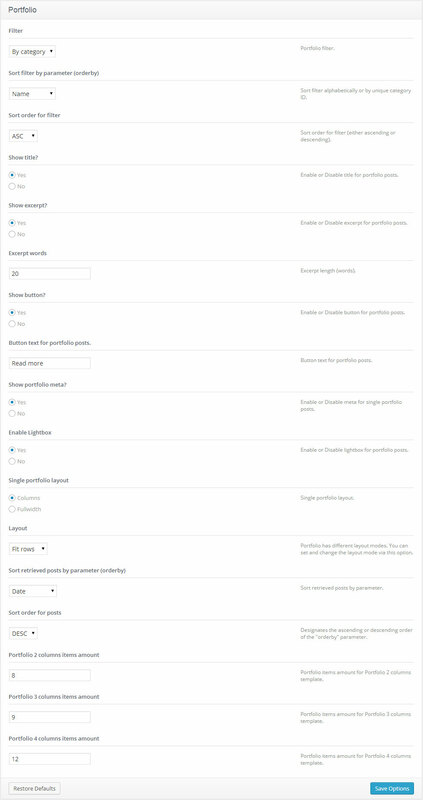 WordPress will have inserted a shortcode for your audio or video that will be replaced with the player. Maybe you uploaded an audio or video file to another server, for example Amazon S3 or a file hosting service. Just enter the URL to your media file (unlinked) on a line of its own. 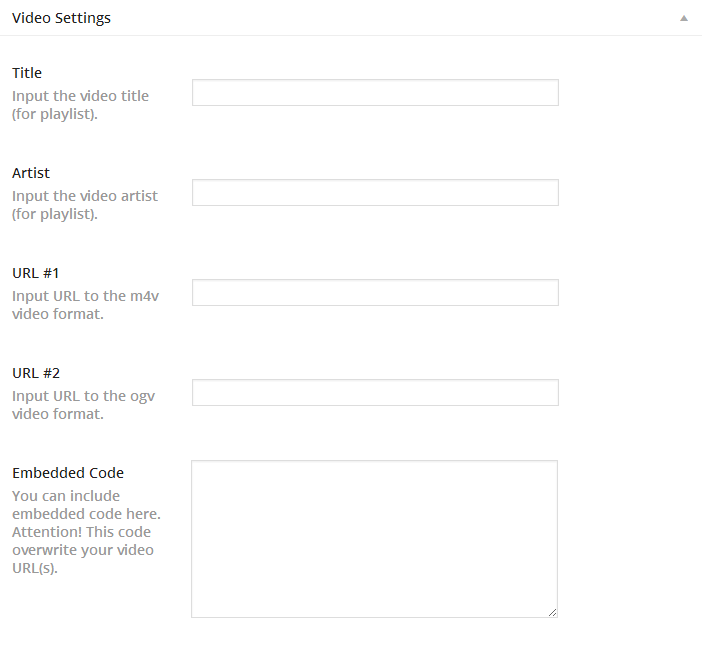 For example, you want to embed a YouTube video. Simply paste that into your content on a line of its own and the YouTube player will show in its place when you publish. Be sure that the URL is not linked. Note: your theme may not contain some plugins listed below. Description: Contact form for the contact page. 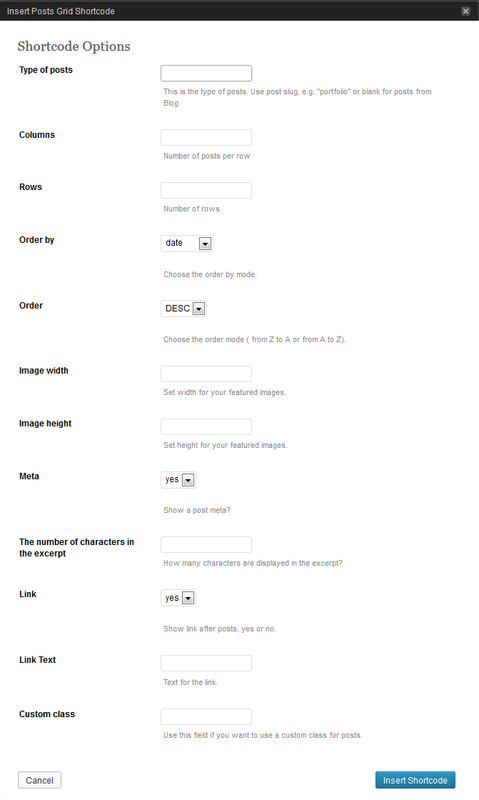 Description: Adds various ways for your visitors to sign up to your mailing list (checkbox, widget, form). Number of comments to show: - Number of comments to show. Category Slug: - Post Category Slug. 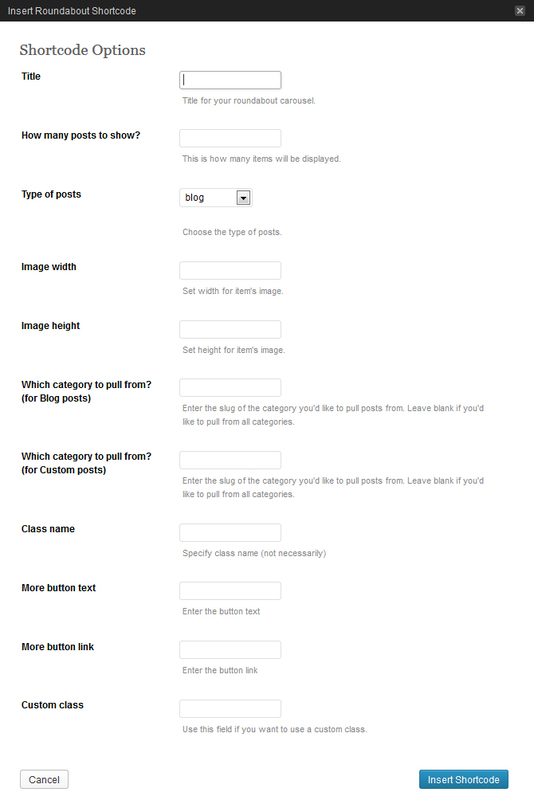 Post Format: - Choose Post Format for displaying posts. 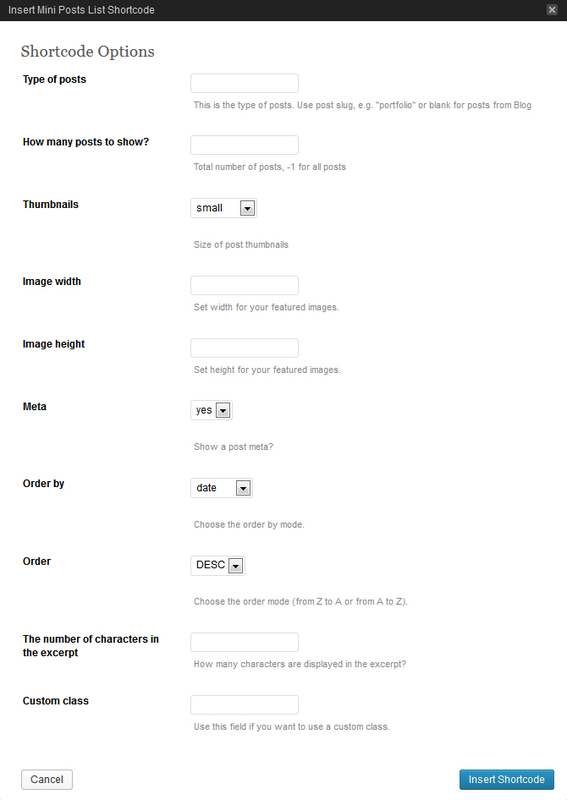 Post Order: - You can choose the order for displaying posts. Posts per page: - The number of posts to display. Excerpt length (words): - excerpt length (the number of words). Link Text: - the Link Text that is displayed after the Recent Posts. Link Url: - the Link URL that is displayed after the Recent Posts. Container class: - wrapper class. Set to featured_custom_posts by default. Link URL: - link URL. Both - icons and text. Add link: - your banner link. Link Text: - the link text under your flickr photos. The following theme contains the Settings option. These settings allow you to change the theme’s color palette, order of items, turn items on/off and do lots of other things. In order to use these settings, please go to Appearance → Cherry Options. Body styling - you can select the body color and the background pattern. Header styling: - Header background image and fill color. Buttons and links color - Buttons and links color. Buttons and links hover color - Buttons and links hover color. Note: Font marked with an asterisk (*) means that it will be loaded from the Google Web Fonts library. Note: Font marked with * means that it will be loaded from the Google Web Fonts library. Display search box? - show/hide the search bar in the header. Display breadcrumbs? - show/hide the breadcrumbs in the pages. Custom CSS - if you need to add some CSS rules, but you don't want to mess with the main CSS file, you can use this field. Just insert your new css rules. What kind of logo? - indicates what kind of logo to use, the text one or the image logo. Logo URL - with Image logo selected, you can upload the new image with the help of the 'upload' feature or use any picture from the Media Library. Note: an asterisk * near the font means that the font will be loaded from the Google Web Fonts library. Favicon - you can upload the new favicon with the help of the 'upload' feature or use any picture from the Media Library. Mobile menu label - This text is visible in mobile select menu. Use stickUp menu - Enable this option if you want to use stickUp menu. 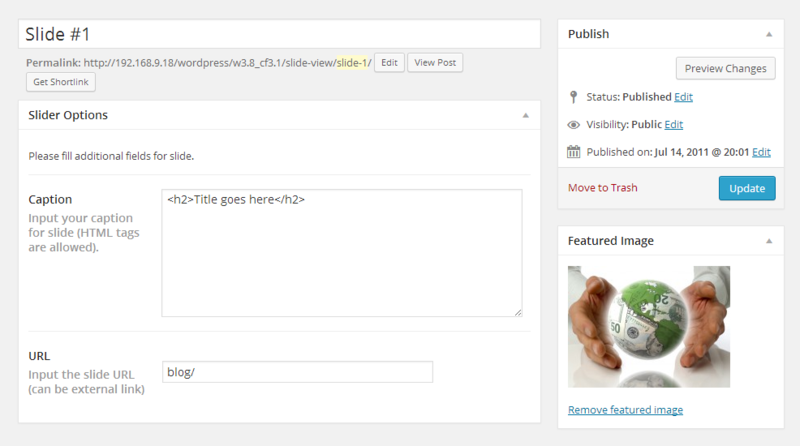 Slider height can be defined in "wp-content/themes/theme###/slider.php". Edit "height" value in $slider_default_params array. You can switch off the slider. Slideshow - Animate slider automatically? Next & Prev navigation - Display next & prev navigation? Display next & prev navigation only on hover? - If 'yes,' the navigation button (prev, next and play/stop buttons) will be visible on hover state only, if 'no,' they will always be visible. Play/Pause button - Display Play/Pause button? Slides to display - Select the slides that you want to be displayed on the slider. If no slide is selected, all slides will be displayed. Pause on mouseover - The auto play will pause when you mouse over the slider. Pause time - pause time (ms). Animation speed - animation speed (ms). Animation slowdown - You can choose different types of animation slowdown for transition of slides. Mouse events for transition of slides - You can choose different types of mouse events for transition of slides. Active slide - Set the number of slides that will be active by default. If the value is 0, all slides will be of the same width when a page loads. Should images be uploaded on page scroll? - you can enable images load only as you scroll down the page. Otherwise images will load all at once. Post publication date - Should the post publication date be displayed? Author of the post - Display the author of the post? Direct link to the post - Should the direct link to the post be displayed? 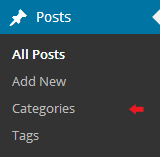 Post categories - Should the post categories be displayed? Tags be displayed - Should the tags be displayed? Number of comments - Should the number of comments be displayed? Number of views - Should the number of views be displayed? Number of likes - Should the number of likes be displayed? Number of dislikes - Should the number of dislikes be displayed? Show title? 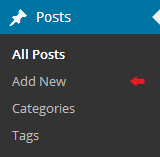 - Enable or Disable the title for portfolio posts. Show excerpt? 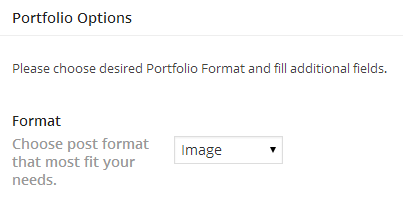 - Enable or Disable the excerpt for portfolio posts. Excerpt words - Excerpt length (words). Show button? 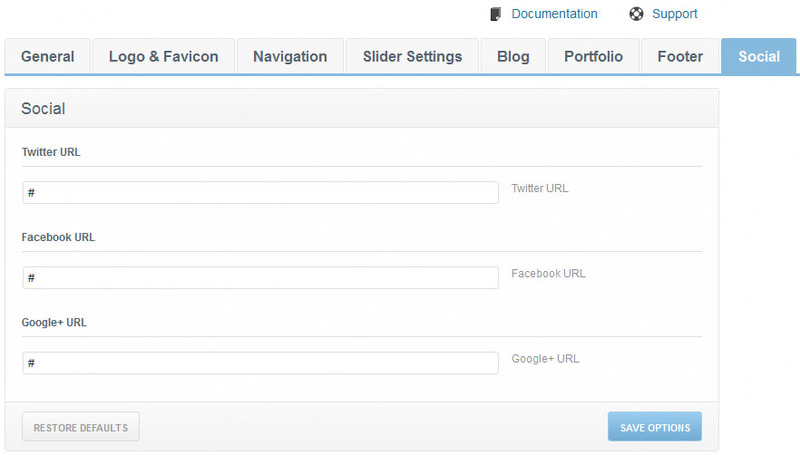 - Enable or Disable the button for portfolio posts. 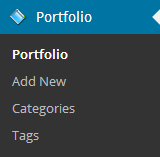 Layout - Portfolio has different layout modes. You can set and change the layout mode with this option. Portfolio 2 columns items amount - Portfolio items number for Portfolio 2 columns template. Portfolio 3 columns items amount - Portfolio items number for Portfolio 3 columns template. Portfolio 4 columns items amount - Portfolio items number for Portfolio 4 columns template. 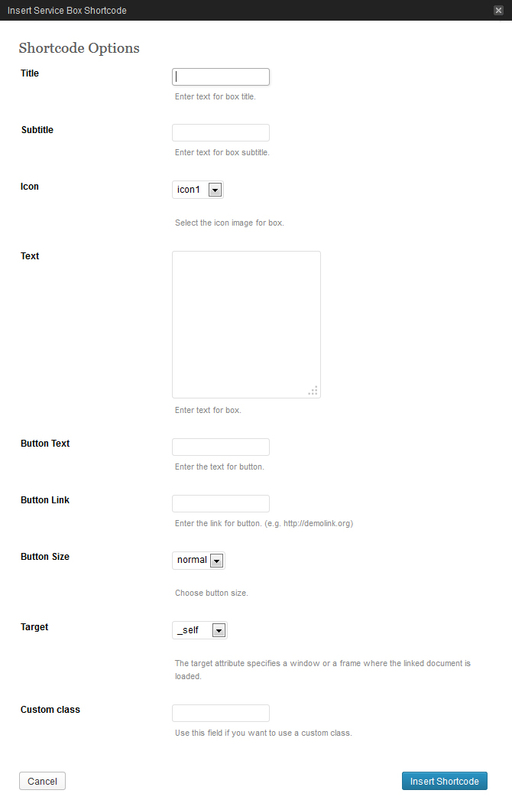 Footer copyright text - footer text content. 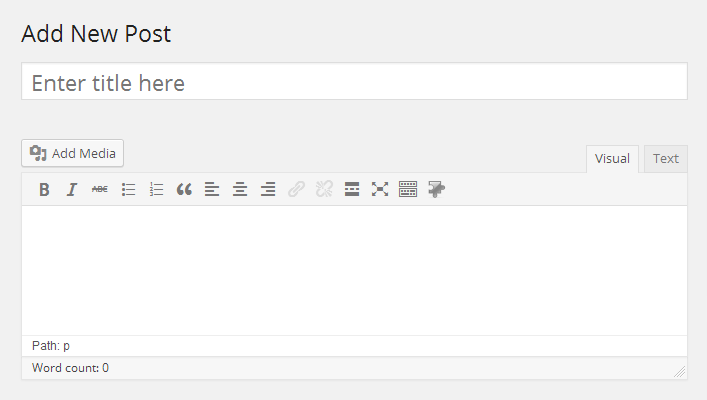 If the text field is empty, the default content will be displayed. It is located in the footer.php file. Google Analytics Code -you can put a code for gathering your site's SEO statistics. For instance, Google Analytics Code. 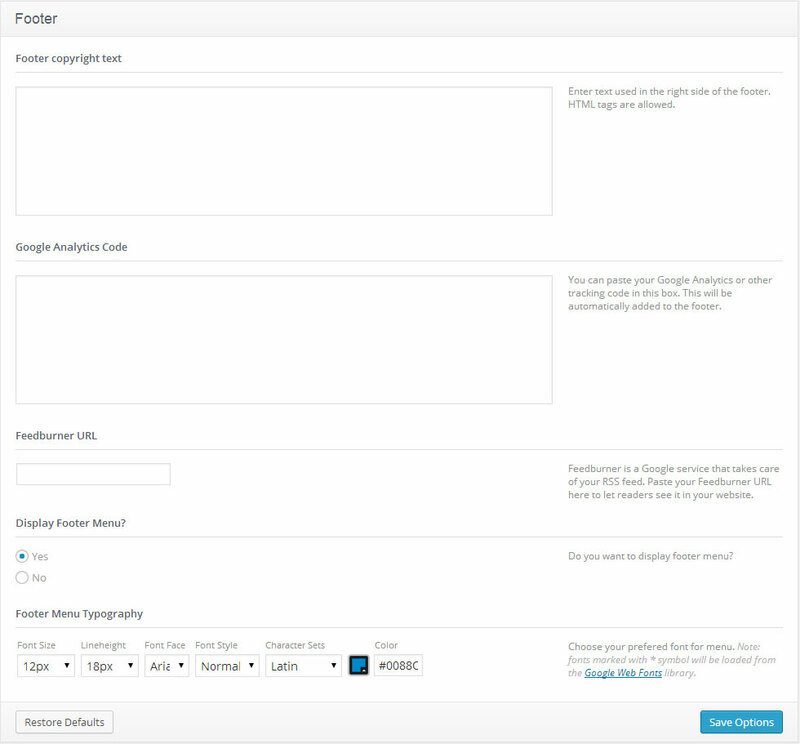 Feedburner URL - Feedburner is a Google service that takes care of your RSS feed. Paste your Feedburner URL here to let the readers see it in your website. 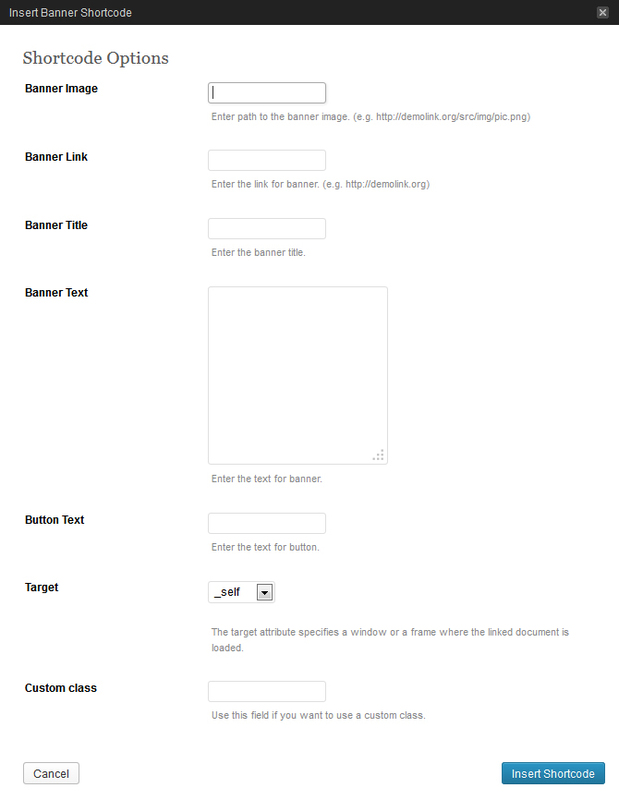 Display Footer menu - enable or disable the footer menu. For your convenience, we have added a Cookie Banner in Cherry Options. Display Cookie Banner? - Should the Cookie Banner be displayed? The sections 'footer logo,' 'contacts' and 'social' below are optional. Some themes may not include them. Logo Image Path - with Image logo selected, you can upload the new image thorugh the 'upload' feature or use any picture from the Media Library. Street Address - street address. Phone number - phone number. Facebook URL - Facebook URL. Google+ URL - Google+ URL. RSS URL - RSS URL. Pinterest URL - Pinterest URL. Linkedin URL - Linkedin URL. Display login links? - Display login links in the shop menu? User profile link - user profile link title. If you use macro %username% it will be replaced with the current username. For example Site %username% . Logoff link - Logoff link title. Click the 'Get your code' link. Insert your generated site ID code into the field in Shop Options tab (Live Chat account ID Option).